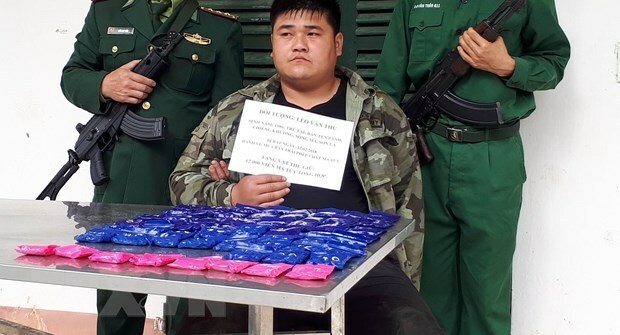 Hanoi (VNA) – The Ministry of Public Security revealed on March 25 that it had handled a total of 30,196 law violation cases from November 16, 2018 to February 15, 2019. Of the total, 10,515 cases were criminal ones; 6,590 violations of the environment law; 6,552 related to drugs and 71 to corruption. Major General Pham Van Cac, head of the Drug Crime Investigation Police Department, said that in the period, the public security force detected several major drug rings, most recently the case in Ho Chi Minh City with 300kg of drugs seized. The amount of drugs seized in this period was equal to that of the whole 2018, Cac stressed. Moreover, the force discovered 3,033 cases involving 3,530 suspects of illegal firecracker trafficking and use, with 27,794 tonnes of the contraband confiscated. It has also exerted efforts to ensure traffic safety and reduce traffic accidents and congestions in major urban areas. In the reviewed period, more than 959,600 traffic violation cases were handled, with 676 billion VND (29.1 million USD) collected.